Result of a meeting between the Kenyan Opiyo Okach and the Congolese Faustin Linyekula and the German-Ethiopian Afrah Tenambergen, La Compagnie Gaara founded the bases for a new east African dance as discovered at the African Choreographic Encounters of Luanda in 1998 with Cleansing, a piece in which the mundane gestures of everyday cleaning evoke sometimes violent purification. The prize wins them various invitations to festivals in France, notably Montpellier Danse 1998, as well as on the African continent (Marché des Arts du Spectacle Africain, tour of East Africa). 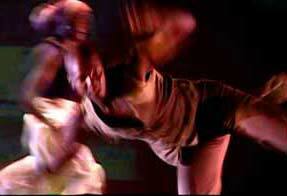 It brought them recognition as one of the pioneering dance companies of Africa. exchanges. Having met the company during an African tour she invites them to for a first residency in at Ballet Atlantique. In 1999 she supports, with the collaboration of Centre Chorégraphique de Montpellier, the new creation of the company, Rituals of the Rock, a double creation inspired by the mythology of nomadic ethnic groups in East Africa: Dilo a solo of Opiyo Okach and Kit Mikayi – a trio for female dancers. From 2000 la Compagnie Gaara brings together Ballet Atlantique Régine Chopinot, Association Française d’Action Artistique and La Maison Française de Nairobi around a long term choreographic development project targeting artists from different disciplines in Kenya (traditional dance, theatre, cabaret, fashion, visual arts…). Between autumn 2000 and January 2002 over twenty artists follow the program titled Générations 2001, made up of workshop modules led by Opiyo Okach and as well as dancers and choreographers invited in residency in Nairobi. 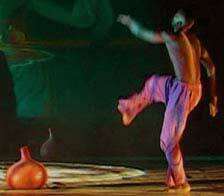 The creation of the piece Abila in June 2002 is one of the results of this process. Thanks to the support of the Ford Foundation, Gaara Dance Foundation is created in 2002 to consolidate the choreographic work initiated in Kenya. Its activities, choreographic research, artist residency, regional & international choreographic exchange, support for creation and diffusion of work have grown since January 2003 at the Godown Arts Centre – the first renovated warehouse pluridisciplinary artspace in Nairobi. The activities of the foundation have taken regional magnitude with projects such as Danceworks – annual platform for new east African choreography organised in since 2003. The Dance Encounters of Nairobi (Retratcing Connections 2004 & Encoding Identities 2005) opened up to companies from beyond Kenya, Uganda and Tanzania. Alongside annual regional encounters and development program the wider encounter will continue as a biannual from 2007.